Shades of Brown Art Exhibit is on display at Gallery 23 in the UTSA Student Union until Feb. 22. 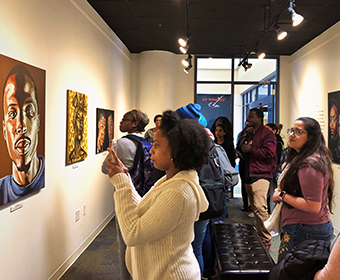 (Feb. 1, 2019) -- As a multicultural university that encourages diversity and inclusion among individuals of all backgrounds and with varying points of view, UTSA will celebrate Black History Month. Through the month of February, the UTSA community is invited to join student organizations, colleges and departments at events that commemorate the African American people, places and events that have paved the way for racial equality. Observe the artwork of UTSA alumnus Kaldric Dow ’13, which explores the ideas of representation of African Americans. Friday, Feb. 1, 11 a.m. – 1 p.m.
Join fellow Roadrunners for the social kick off of Black History Month. Hosted by the Student Center for Community Engagement and Inclusion and UTSA Libraries, the event will also feature books by African American authors. Thursday, Feb. 7, 4 p.m. – 5: 15 p.m. The UTSA African American Studies Program will host a panel of speakers to explore business, education, politics and entertainment. Saturday, Feb. 9, 8:30 a.m.
Join Thrive Ministries and help feed others in the community. View a pop-up exhibition of African American authors hosted by the UTSA Libraries. Tuesday, Feb. 19, 5:30 p.m. - 7: 30 p.m.
NSBE alumni will come back to answer questions that members have about life as an engineer outside of school. Black History Month Trivia Tabling/Pie A Professor! This interactive trivia tabling game will be a chance for students to learn about black history and STEM related black history. Put on some skates and join fellow Roadrunners for fun on the rink. Thursday, Feb. 21, 11 a.m. and 6 p.m.
Student Union, Retama Auditorium (SU 2.02.02), 11 a.m. - 1 p.m.
McKinney Humanities Building (MH 2.01.30), 6 p.m. – 8 p.m.
Watch an independent film that showcases the black history of San Antonio that focuses on the contribution and achievements of African Americans from our community. Monday, Feb. 25, 1 p.m. – 3 p.m. Listen to stories from author Michael Hurd’s “Thursday Night Lights,” which showcases black athletes and the history of black high school football in Texas during segregation. Wednesday, Feb. 27 6 p.m. - 8 p.m. This event will highlight a feature on NPR Code Switch of the Race and Identity through Pop Culture course in African American Studies and the focus on UTSA students discussing topics impacted by racism. Attendees will be listening to the podcast and discussing it with the instructor and students. Thursday, Feb. 28, 6 p.m. – 10 p.m.
Students are invited to a semi-formal dinner banquet with an awards presentation and dancing. Tickets are required and can be purchased at Roadrunner Express through Feb. 19. See a list of all UTSA Black History Month events. Learn more about UTSA Student Center for Community Engagement and Inclusion. Learn more about UTSA African American Studies Program.